Jaqui will be teaching the morning yoga practice and some therapeutics at this convention. To get an idea of what happens at this conventions see below. 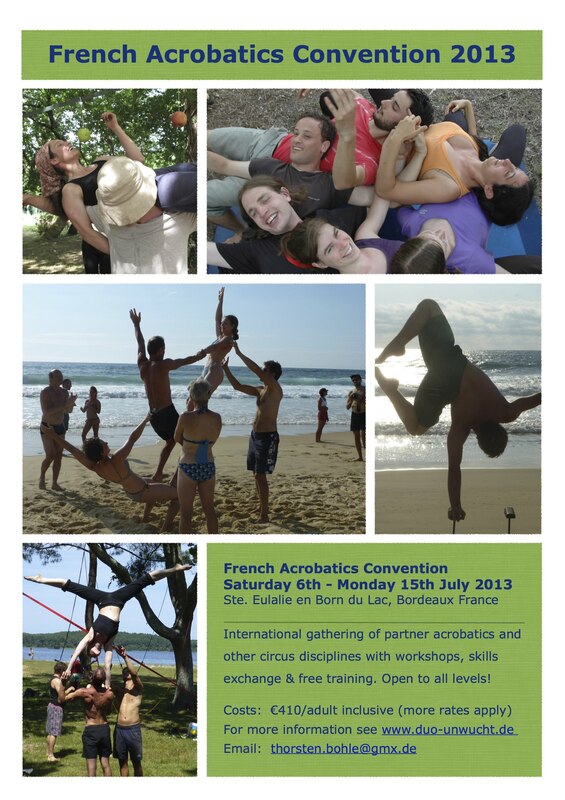 After attending and teaching at the 3rd International Acrobatics Convention in France, I was left aghast at the shear level, skill and expertise of both the teachers and participants who attended. It was a fabulous opportunity to learn from the amazing and abundantly experienced teachers, not only running the workshops but participating at the Convention also. I was left often shell shocked by the potential of what human bodies can do with focus, direction and lots and lots of training. It just makes me realise how much of a journey I have ahead of me on my acrobatic path. Needless to say the pictures supporting the blog are here to inspire rather than to shock. 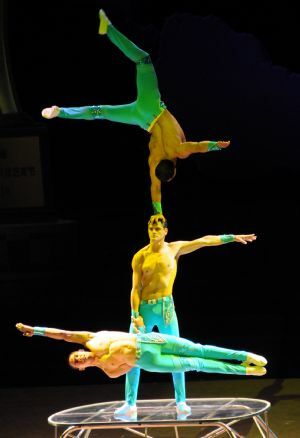 Jaqui Wan & Jesse Saunders will be resident AcroYoga & Yoga teachers thorough out this gathering International exchange and free training, as well as workshops with international artists, mostly on partner-acrobatics, but also on other circus disciplines. The meeting will take place in St. Eulalie en Born du Lac, app. 70km south west of Bordeaux. The site of the convention is located directly next to a big campsite, itself situated less than 100m from the large “Etang de Biscarrosse” lake and otherwise very isolated. There is a sandy beach at the lake, where it is possible to play volleyball. Acrobatic can be easily practiced in the water, as the banks are very shallow. 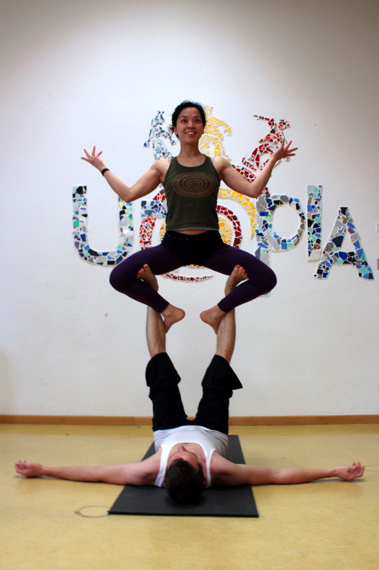 This year I had the opportunity to offer Acroyoga at Buddhafield. This established cultural festival is organised by the Friends of the Western Buddhist Order and takes it roots from the Mahayana tradition. Held in July, this 5 day event is celebrated in the beautiful coppice woodland of the Somerset countryside. 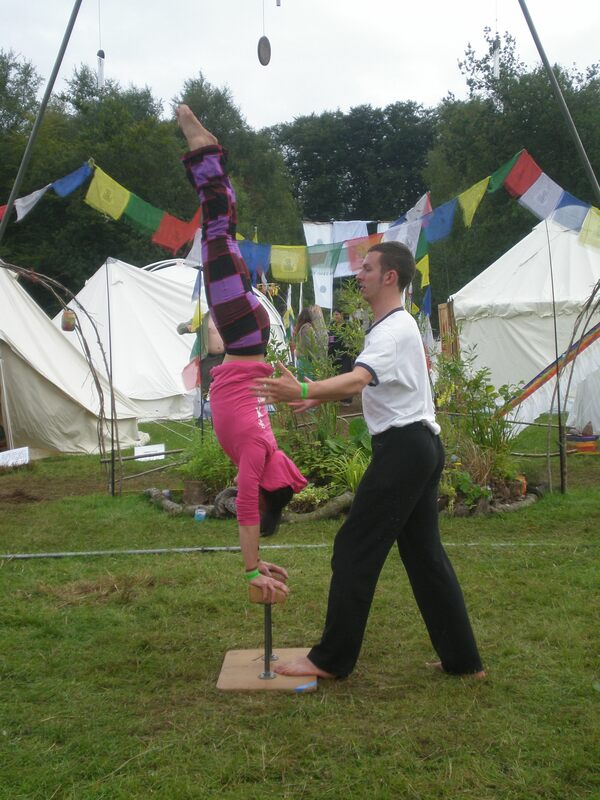 I also had the privilege of a teaching partner, Tobias Frank – a wonderful Acroyoga teacher from Cologne; we were both full of anticipation and apprehension for what the Festival had in store: poised to enjoy, to learn and to meet. So with the spirit of adventure, a bell tent, some handstand blocks and chalk at the ready we made our way. After a long drive to the West country we arrived but by the looks of it, grey clouds had followed us all the way from London. Unfortunately I prepared for every possibility, except that of rain in Devon in July. And as it turned out not passing rain clouds, but constant rain. Embrace it, we did. Me, booted with wellies and Tobia with flip flops, we commandeered some wheel barrows and trundled our effects through the mud tracks of the undulating hills and erected the tent under the grey canopy of the steadfast Nimbostratus. With such wet conditions, the on site sauna became an even more grateful and fond delight. As the days went on, the rain persevered and my poor tentmanship cracked under duress. Folly number 1: forgetting to tuck the edges under the ground sheet. Result: wet bedding! Folly number 2: not maintaining the integrity of the guy ropes. Result: No tent top! The hardship and realities of camping were sent to test us, but it did not dampen our spirit – everyday we had the chance to share the blessings of Acroyoga to a warm, playful and receptive community; an honour which I would gladly volunteer again and again and again.